About - The Davies Law Firm, P.A. Since 1983, I have provided caring and responsive representation to clients and their children throughout the process of divorce. I have the experience to effectively handle complex legal challenges, and am dedicated to protecting my clients' rights. I have handled a wide variety of legal issues, including: divorce, custody litigation, paternity and support, equitable distribution of assets, interference with child custody, harassment, expungement, contempt of domestic violence restraining orders and municipal court matters. I have tried and won domestic violence cases, on behalf of both men and women. I am rated “BV” by the Martindale Hubbell Peer Review, indicating ‘Very High’ standards of conduct and ethics, reliability, diligence and other criteria relevant to the discharge of professional responsibilities, and “High to Very High” legal ability. I graduated in 1983 from American University School of Law, where I was appointed a Dean’s Fellow. 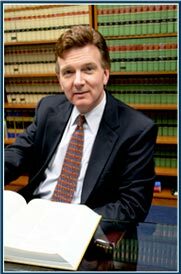 I clerked for The Honorable Thomas S. O’Brien, Judge of the Appellate Division of the Superior Court of New Jersey, and am the Attorney for the Zoning Board of Adjustment of the Borough of Franklin Lakes, Bergen County, New Jersey. I am the founder of The Divorcing Men's Support Group. We currently meet every second Monday of the month at 32 Chestnut Street, Ridgewood, New Jersey. Feel free to stop on by! This is not a legals issues group! This is for divorced/divorcing men to get a chance to ask questions and benefit from other's experiences. The emotional cost of divorces is huge. The Group is a place to talk things over, discuss with other people how they have dealt with the issues that all of us face when going through a divorce. It is a way to give back to the community. I was appointed as Panel Chairman of the Supreme Court of New Jersey District Fee Arbitration Committee, District II-A, North Bergen, Panel E. The Fee Arbitration Committee is appointed by the Supreme Court of New Jersey to hear and decide disputes between lawyers and clients over attorney's fees. I am committed to making certain that attorneys charge fees that are proper for the services provided, and also that attorneys are paid for the work that they have done. I volunteer with Manavi, a support group that helps South Asian women deal with domestic violence. The training has allowed me to be better equipped to deal with the specific issues that South Asian women face in these types of situations, such as cultural, linguistic, and immigration barriers. I also volunteer many times a year to represent women who are victims of domestic violence in Bergen County to get them the Final Restraining Orders that they need for protection from their abusers. These women can not afford an attorney, and seek help from the Domestic Violence Legal Advocacy Project of the Bergen County Department of Human Services, Alternatives to Domestic Violence. I am also involved in the Ridgewood Soccer Association and several charities.